The search results are good: While Google has been taking time to improve their results lately, it’s refreshing to see original content get ranked higher than web scrapers. In fact, the web scrapers have a tendency to not show up at all on DDG. Lots of documented goodies: I’m still getting my feet wet with DDG, but the ridiculous amount of goodies is going to make things a lot more enjoyable. I like not having page previews by default: I’m not sure if DDH even supports this, but I absolutely HATE having preview panes pop up in Google by default. Can it be turned off? Yes. Am I too lazy to do it? Yes. Directly search other sites: You can search other sites directly, which is a nice feature. Try “!amazon Founders at work”. Instant Answers: Sometimes you don’t need to click-through to a page. For instance, search “jquery” and you get a handy little box that tells you what jQuery is, and where you can get more info about it. For someone new to jQuery, that little bit of information could help them make a more informed click to learn more. I miss instant search: I would really like to see an option for instant searching on DDG. Being able to refine your search results letter by letter was really handy. I miss other Google service integration: Searching for “coffee near 49503” would show a map with coffee houses on it in Google. In DDG, my results aren’t nearly as useful. I hope that some sort of map integration is in there future, because it would stop me from switching back to Google to use their map service. What do you like about DDG? What features do you wish it had? Author Jack SlingerlandPosted on November 11, 2010 Categories OtherTags google, TechCrunch14 Comments on Are we really worth 3.5 million? It’s not easy knowing what to write about. When you run a niche site like this, it’s even harder. One of the tools I rely heavily on to tell whether I should invest the time writing a post or not is the Google Keyword Tool. The Google Keyword Tool allows you enter key words, and then it tells you the monthly search volume on those words, the competition, and even monthly local searches. But it doesn’t stop there, it gives you other keywords that may be relevant to you and displays statistics on those as well. By far though, the most important feature is the competition rating. It lets you see if you should even bother trying to go after that niche or not. When trying to view PDF files on the internet, you have a very limited number of choices. The obvious one is to let the user handle viewing PDFs with something like Adobe Acrobat Reader. However, some users don’t have Acrobat installed. Or the file gets downloaded instead. 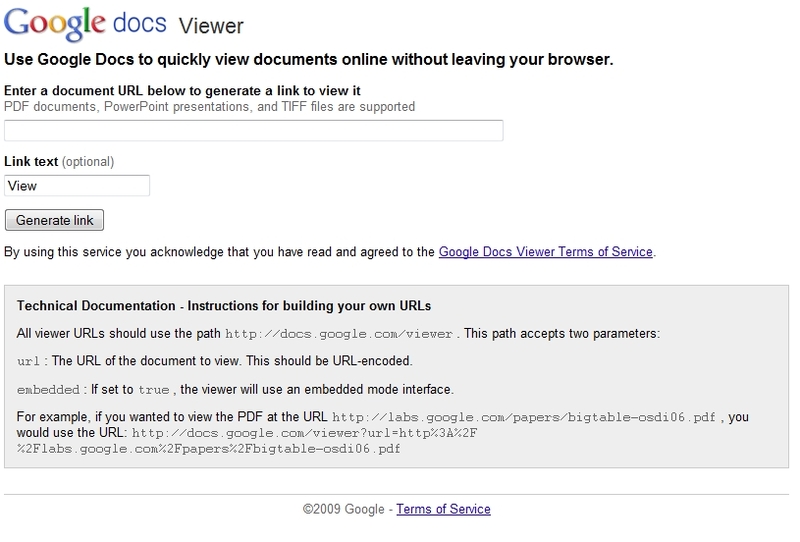 If you want an easy way to view PDF files online though, look no further than Google Docs.